Car Racing from Simon Job on Vimeo. The video shows the results when the car is pulled back 5 cm, 15cm and 25 cm. In Part Two of the video, the results are shown when the car is pulled back 10 cm, 20 cm and 30 cm. My thought is that the teacher would show the first three results and make a table of the data. Then, make predictions for 10 cm, 20 cm and 30 cm. A note on the way I set-up the experiment – the car does not start from zero. Rather, the car starts from 30 cm out and is then pulled back the required distance. This should make sense in the data table below. Enclosed in the file below: 1. Excel file with data, 3. 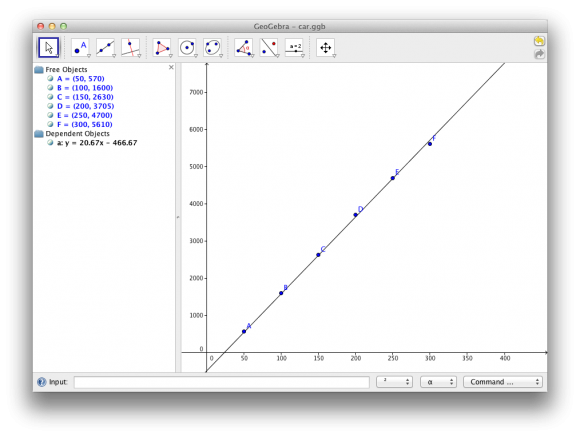 GeoGebra file. (The video file can be downloaded from the Vimeo page). This was a bit of good fun to make, there are certainly some things that could be done better. Music: “Breakdown” by Kevin MacLeod from Incompetech. Added to the file below, a worksheet I created for Year 8 to consider how modelling a linear relationship allows you to predict a result. Also includes a PowerPoint file used to help students plot the results and predict. Nice work! One might wonder why it's a linear relationship, and what's with that little swerve it seems to do at the end? What's the hardware and software being making the video? Stunt driving. Just my Canon Ixus on a small tripod and iPhone camera for the measurement shots. Put together in iMovie. This is awesome. I'm going to run this with my class when we do linear relationships. Now i need to see if the maths department are willing to buy the cars! Well, my intention is that you could do it without the cars - just use the video. Some toy cars need you to pull them back a couple of times (or a long way) as opposed to this particular car. Thanks Simon. Had fun with the cars activity with a stage 3 enrichment group from local primary schools. They compared flooring around the school and had to re-evaluate their hypotheses at the end. hi - came here from [url="http://fawnnguyen.com/2013/10/10/vroom-vroom.aspx?view=threaded#Comment"]Fawn Nguyen's post[/url] -- trying to figure out if this really should be linear, or quadratic. I'm wondering what you make of the feature that the linear model predicts the car will go backwards ~50cm if not pulled back at all (In other words, the non-zero intercept)? Do you or your students have an interpretation of this? Fascinating lesson.